On March 19, Economic Affairs Minister Azmin Ali announced the development of Kulim International Airport. The airport is one of the seven mega-projects planned for Kedah to make the state on par with other more progressive states. It was reported that the international airport will cost RM1.6 billion to build. On the positive note, the project will be fully funded by the private sector. 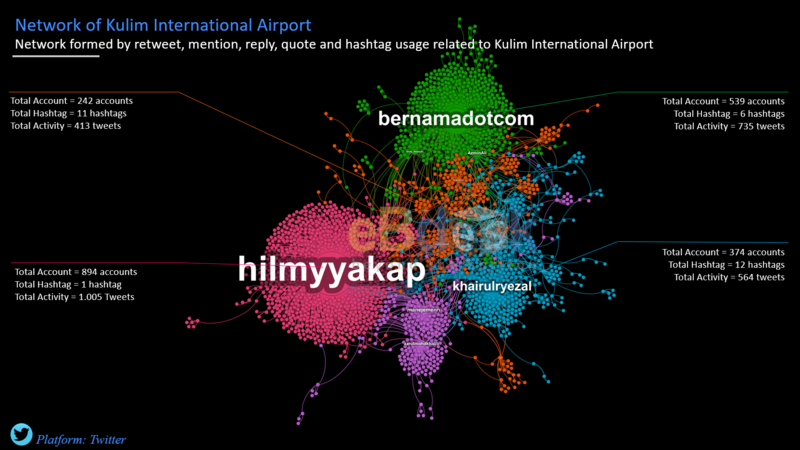 From the Twitter network of Kulim International Airport, we can see that it is divided into five clusters. The cluster in the middle which is the orange group connect the other four cluster together. This is because the orange group is consisting of media accounts as their primary influencers. 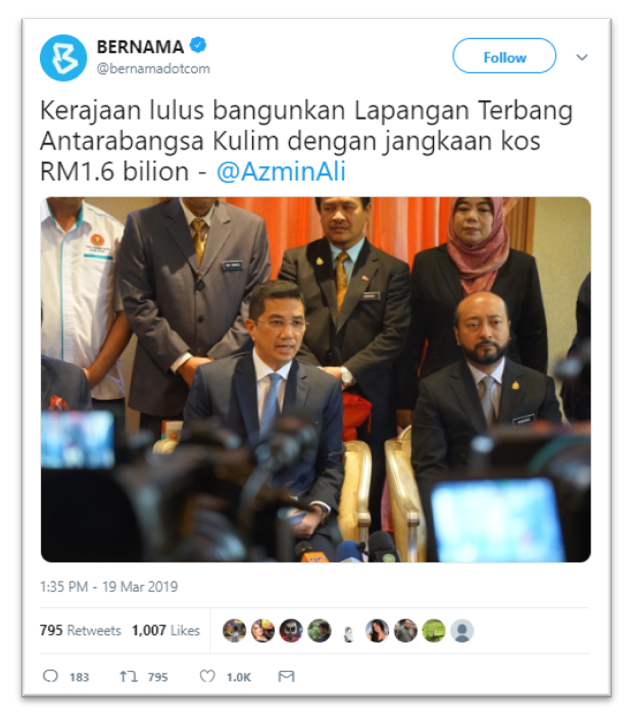 The news that they tweeted are on Azmin’s revelation that Kulim International Airport will be fully funded by the private sector. On top of the network is the green group with @bernamadotcom as the main influencer. The tweet that gathered huge feedback is about the government approval on the RM1.6 billion airport. It gathered 795 retweets and 1,007 likes. Besides, the green cluster has some small groups that infiltrate into other clusters. This indicate that the news on the project cost was also been discussed in other clusters. Meanwhile, the biggest cluster is actually the pink group with@ hilmyyakap as influencer. Additionally, the pink cluster has an almost perfect round shape. This means that most of the users in the pink cluster only reacted to @hilmyyakap’s tweet. 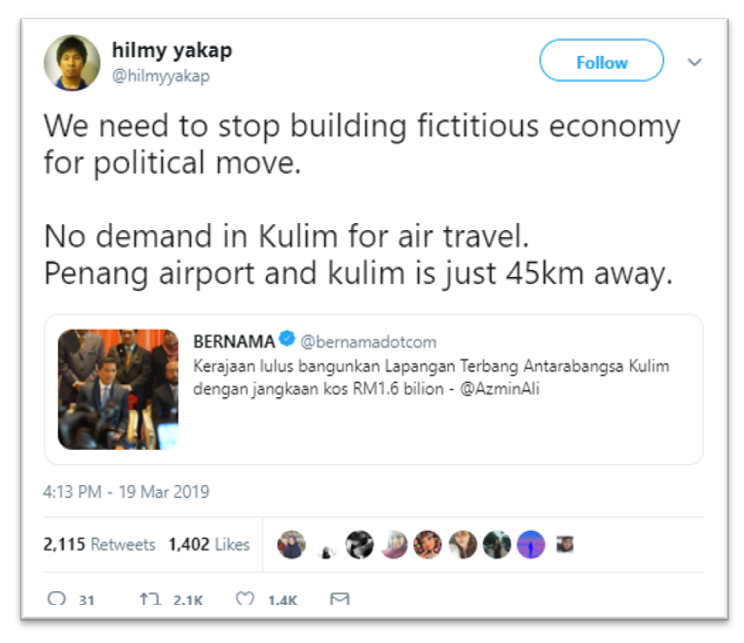 The popular tweet by @hilmyyakap is about the necessity of Kulim Airport. The influencer claimed that the project is just another political move hiding behind the initiative of improving the nation’s economy. Plus, he argued that the Penang airport is just 45km away. Following, is the blue cluster. The cluster is spreading pretty widely across the whole network. The cluster influencer is @khairulryezal, who also has a similar argument with @hilmyyakap. @khairulryezal’s tweet mentioned the close proximity of Kulim Airport with Penang Airport. 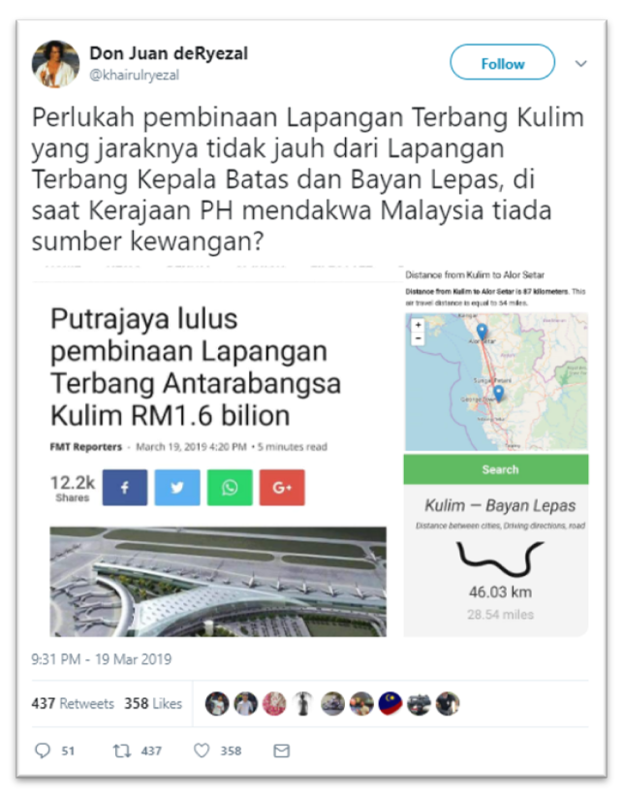 Additionally, he also criticised the costly price of RM1.6 billion for the project, questioning the government’s claim of being low in source of income. Last but not least is the purple cluster. This cluster is smaller and did not spread as far as the blue cluster. But the purple cluster has two influencers, @manejmenn and @azrulmohdkhalib. Looking at theirs tweets, both influencers are also against the development of Kulim Airport. The same arguments were used, the international airport is too costly, and it is redundant as Penang airport is within the proximity. 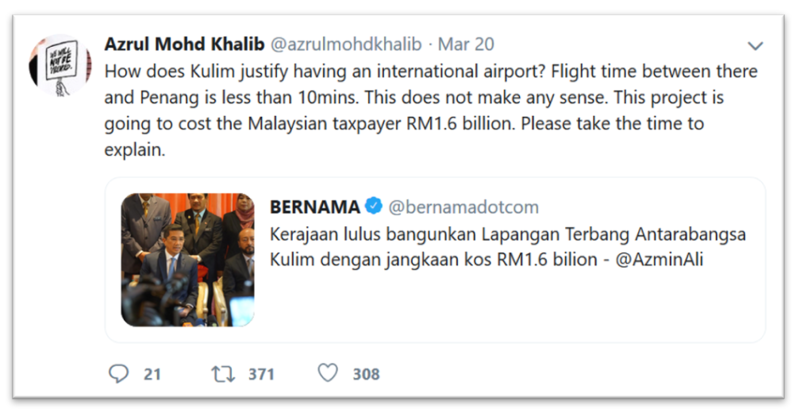 Overall, the announcement of Kulim International Airport received a high amount of negative feedback from the netizens of Twitter. From the network, we also found out that more negative reactions to the airport were made after the revelation of it being 100% funded by private sector. So, what do you think about the upcoming Kulim International Airport? Will it boost the economy of Kedah or is it an unnecessary project?